My favourite summer dish, made with stewed onions, tomatoes, and paprika! Cooking: Take the slab (smoked bacon) and cut into small cubes or thin slices. 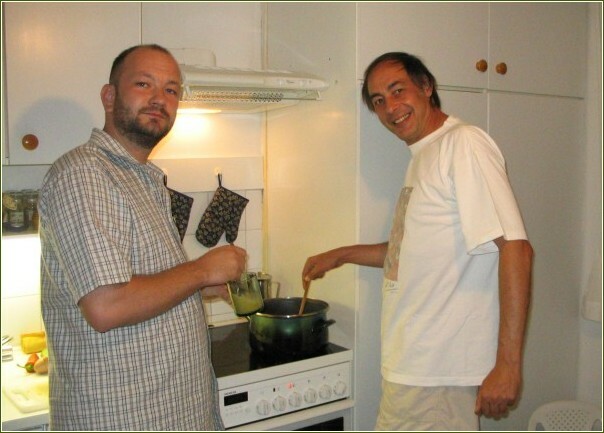 Add to large frying pan with chopped onion and salami and cook in oil untill the onions are soft. Add the peppers and the tomatoes and reduce heat and simmer, covered, for 10-20 minutes, cook without covered for 10-30 minutes, untill left her juice, as You like. Add salt to taste. If You like, You can try it with eggs! Beat the eggs and add to the pot while stirring until the eggs are cooked. Note: When I cook this dish, I use three kind of Hungarian pepper - long pointed hot Green pepper, mild and very matured sweet yellow color Green pepper and red very sweet cheese/tomato-shaped pepper. When I find other kind of peppers in the market, I use, example "Kápia". I like to use many kind of peppers in letcho. 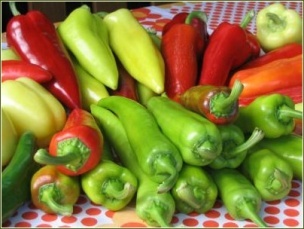 When the yellow colour Green peppers are too matured and the color of pepper has turned to red and the pepper fruit is a little soft, it is called "letcho pepper" ("Lecsó paprika") in Hungarian language, because the too matured pepper is good in letcho. Same the situation with Hungarian salami like the peppers. I use minimum two kind of Hungarian smoked sausage. One sausage with hot paprika ("csípős paprikás kolbász") and one sausage with sweet paprika ("nem csípős füstölt paraszt kolbász").